Rethinking America is a provocative inside portrait of America at a crucial crossroads. 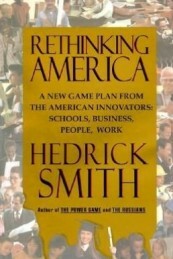 Hedrick Smith takes us inside America’s schools and its corporations, its science labs and its high-tech frontiers, to show how our traditional approach to commerce and education is obsolete for the new global economy-and how our innovators are succeeding by rethinking America. Measuring this country against its major competitors, Smith shows how global competition has radically altered the way people work, what schools need to teach, and the nature of power and people’s relationships on the job. With one insightful story after another, he reveals what goes on inside grade school and high school classrooms and inside big corporations and small companies in the three main capitalist economies; how that affects our future; and why today’s greatest need is a new mind-set. In revealing portraits, Smith contrasts how American CEOs think at giants such as GM, Boeing, Motorola, compared to CEOs at Germany’s Daimler-Benz and Deutsche Bank or at Japan’s Toyota or Mitsubishi. He discloses how differently decisions are made and power is wielded in the corporate boardrooms of America, Germany, and Japan. He shows us what workers think and do in these rival economies and how the lives of workers at companies such as Ford and Motorola were transformed once management began rethinking its approach. Education is where the race begins. Smith contrasts what American grade school teachers emphasize, compared with the skills and values taught elsewhere. He shows how businessmen in Germany and Japan cooperate with educators in creating programs to prepare “mid-kids”-average high school students-for solid careers and how innovative American communities are developing similar strategies. “History teaches us that countries crumble and whole civilizations collapse when their core ideas fail or become obsolete,” writes Smith. From classrooms to companies to government, Rethinking America points the way to creative and effective new ways to think, teach, work, and succeed in the future, and it shows how the American innovators are doing just that.